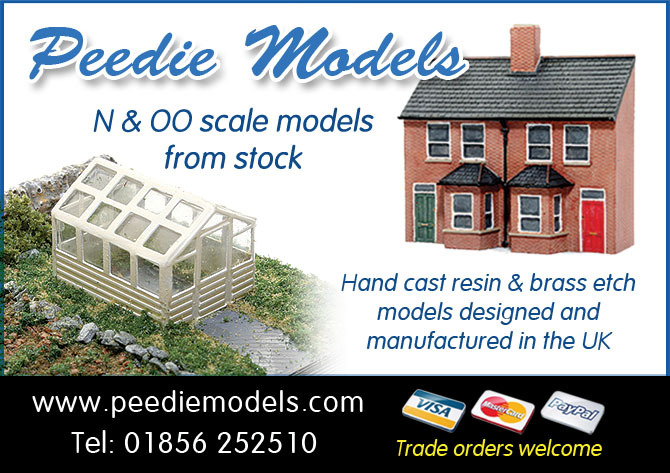 Paul is the owner & founder of Peedie Models based in Orkney, designing and manufacturing a extensive range of detailed photo etched and resin line-side and detailing accessories for N & ‘OO’ scale modellers. My modelling experience covers more then 40 years when I started building model aircraft in the 1970’s by collecting the tokens from cereal boxes. Over the years as I gained various modelling skills and as the models became more complex, my interests changed towards railway modelling. I have always had an interested in engineering and using these skills gained went on to build several over the years. During my working life I have been lucky enough to work in a state of the art photographic & design studios which has allowed me to use various types of design software and photographic equipment, I can now draw upon these skills and use them to create a range of detailed models for the discerning railway modeller. All our resin models are hand cast to ensure we maintain the highest possible detail, and this allows for consistent quality in all out castings. Added to this we design a varied selection of brass etch items, of which some are used in our model kits. A visit to our website will reveal a growing range of products, with more scales coming soon.